Being of natural mind (and being a die hard DIY'er) I jumped at the chance to make my own skin ointment that would not have antibiotics or petroleum or other crap in it. Here is info on a simple ointment you can make at home. I remember when I was a kid my mom always had a tube of Mycitracin handy, and any time we had a cut or anything like that, she would reach for it first. Actually we used to joke . . . "oh, your arm got cut off . . . it'll be OK, just put some Mycitracin on it" LOL!! The kids would probably say that now about the stuff I make. I started out when Xian was a baby (11 yrs ago) making a simple Plantain ointment that I read about in Susun Weeds Wise Woman Herbal for the Childbearing Year. Since that time I have added other locally grown herbs that I find in the wild and have come up with an ointment that my family lovingly called Kelley's Bum Rub (a name that stuck). We use it for absolutely EVERYTHING!! In fact, since having kids, I have never bought any other type of ointment to use for any of their skin issues . . . from cuts to stings, burns, diaper rash etc. And others who have tried it love it too. Plus, I know what is in it and I don't have to spend an arm and a leg to buy something natural. And besides, I can just walk out the front door for the important ingredients!! How cool is that! 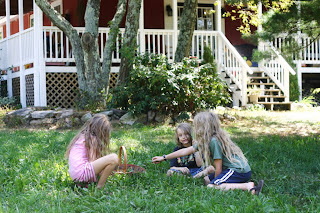 Making your own herbal ointment is not only very useful but it is a great way to include the kids and let them help out. 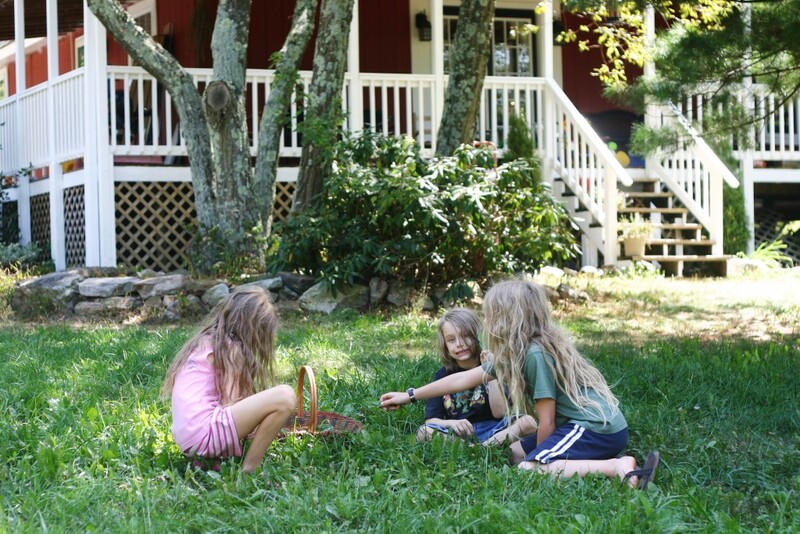 They learn about herbs, how to use them, how to identify them, and how to turn that knowledge and a simple plant into something extremely useful. Plus they make great homemade gifts for family and friends with children or new babies. My family members can count on a jar every year for Christmas (and of course any other time they run out and need more). 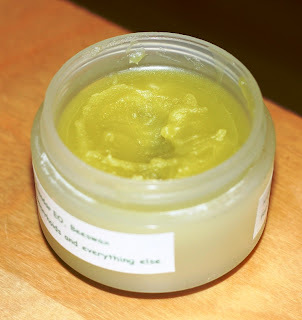 Plantain ointment is easy to make. 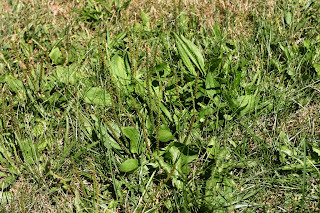 Well, I say easy because it is just one herb, Plantain, that is easy to find and identify and it is just a matter of infusing it with oil, then melting in some beeswax to make an ointment. But it is also time consuming as the whole process takes like 6 wks. So if you want to make them as gifts then you need to plan ahead. 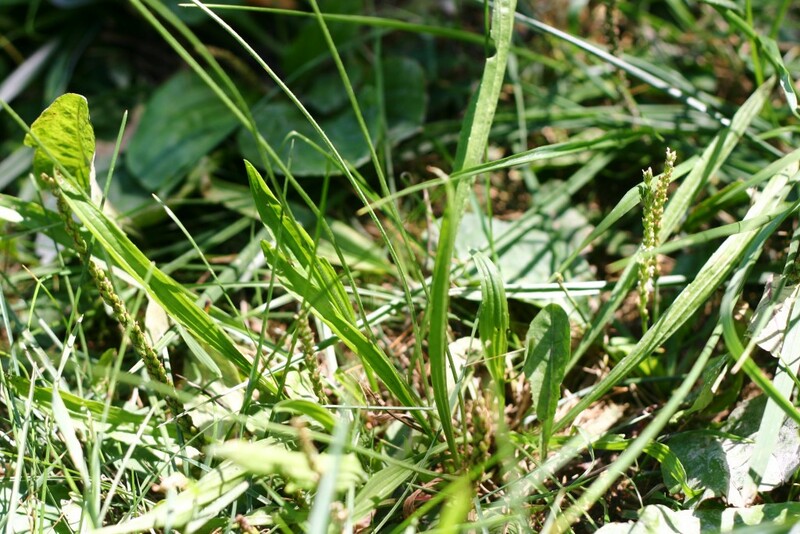 Some of you may be clueless as to what Plantain is, but you will know it when you see it (and no, it is not the banana shaped fruit you sometimes find at the grocery store). 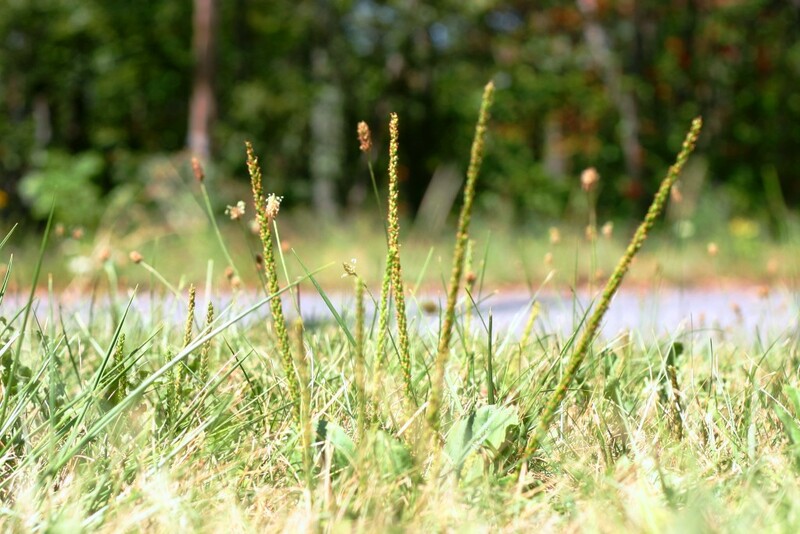 It is sometimes called the sidewalk herb because it is often found growing in the cracks of sidewalks. 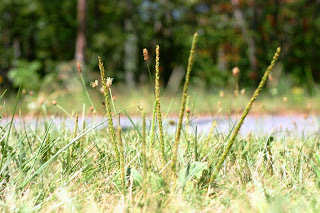 It is a common yard "weed" and the flower stalks are unmistakable (in fact, you probably played with them as a kid, wrapping the stem around the flower head and shooting it across the yard at friends). 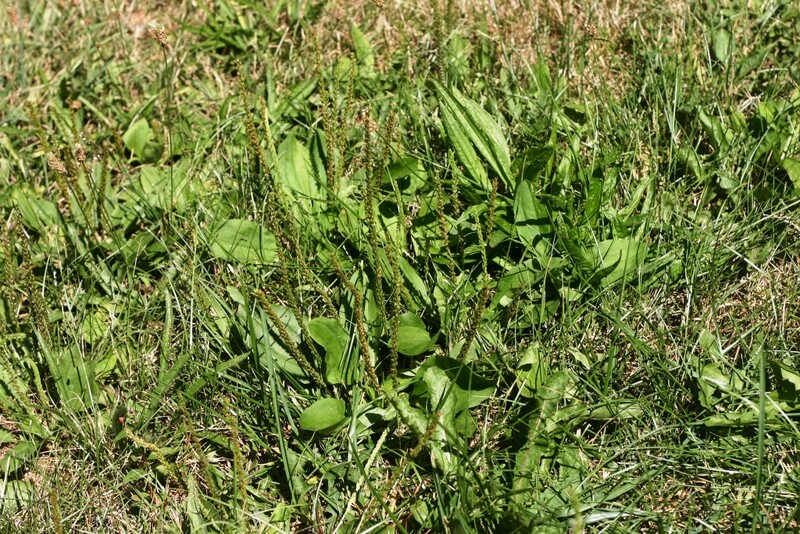 If people only knew the healing powers found in that little weed that invades their yard! First thing you need to do is identify the plant. 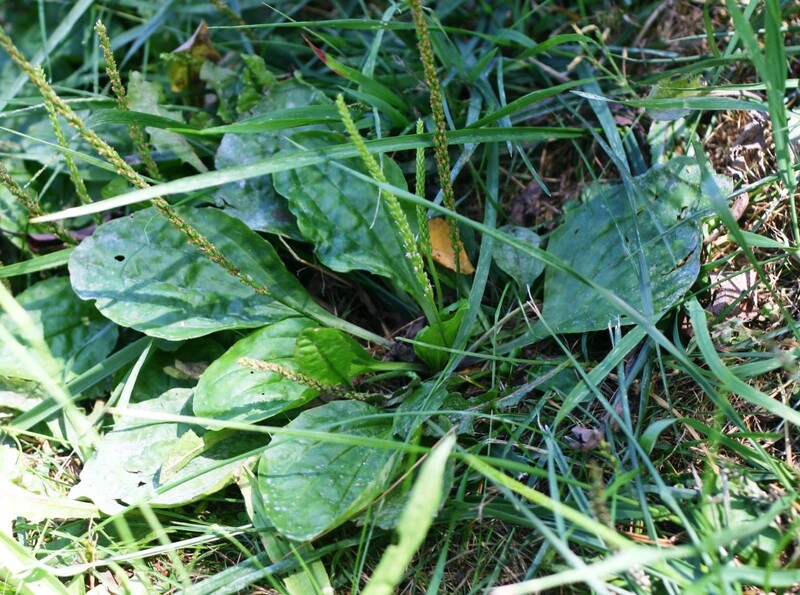 There are 2 main types of Plantain that I use, the Broad Leaf and Narrow Leaf. Their healing properties are pretty much the same. I am sure you have seen both of these, though you may not have recognized them. Making the ointment is a 2 step process. First you need to infuse plantain in oil, then you make your ointment from the infused oil. First collect your plantain. I like to pick it when it isn't too hot, you don't want it wilted by the sun. It is important that it is dry as well. Choose herbs that are bright and healthy looking. If you have a lot of choices then try to get leaves that are free from damage. Also, I prefer not to pick any herb from the side of roads where they could have been exposed to run off or exhaust etc. You are going to want to collect enough that after chopping it up, it will fill your jar. The size of your jar of course will determine how much ointment you can make. After you have collected your Plantain you want to get it into oil as soon as possible. Start by chopping the plantain coursly. If there is any dirt on the leaves just brush it off. 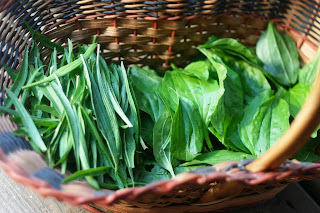 It is important that the leaves are DRY as you prepare to put them in the oil. Fill your jar to the top loosely with the chopped plantain. Pour Olive Oil in till it is about 3/4 full (almost to the top). Take a knife (or something similar) and poke and stir the herb into the oil. 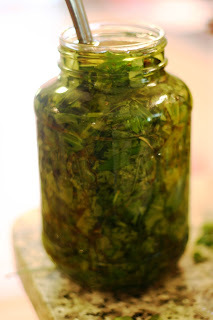 The purpose of this is to dislodge any air bubbles that are trapped in the herb. After you have gotten as much air out as possible fill the bottle to the VERY TOP with oil, then cap. You want as little air in the jar as possible. Let sit for 6 wks. keeping in mind that oil is likely to seep out (so you may want to put something under it, or place it on a surface that won't be harmed by oil). After 6 wks is up you can strain out the herb (though I have let mine sit longer). I use fine mesh strainer and strain the oil into another clean, dry jar. After the oil has been transfered I take the saturated plantain and squeeze out any excess oil from the leaves into the oil jar as well. Place the cap on and let it sit for a few more days so that any water left in the oil is separated out. After a few days you will notice water and sediment at the bottom of your jar, so simply pour the oil into another clean, dry jar, leaving the water/sediment behind. And there is your Plantain infused oil!! 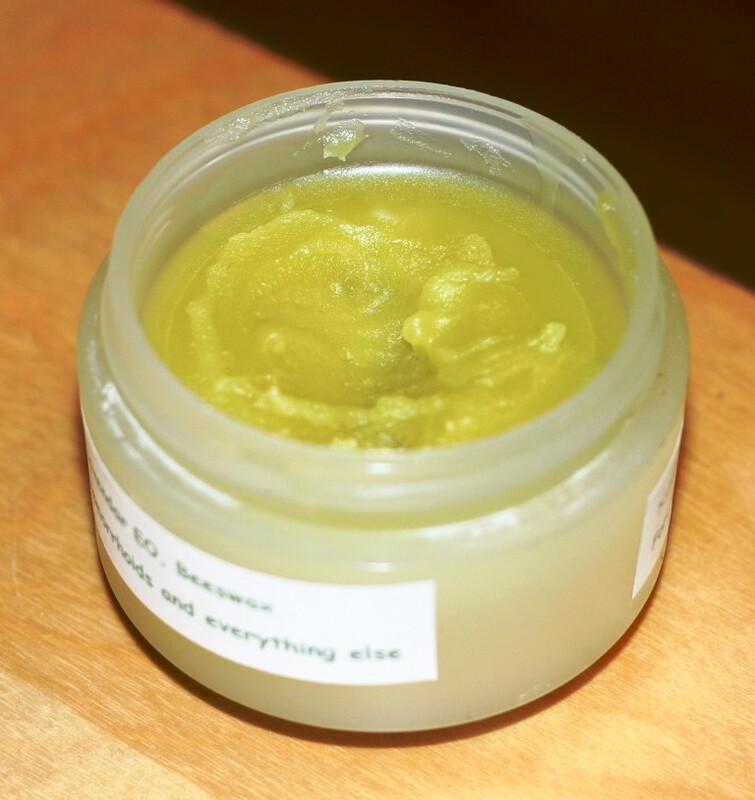 Making an ointment is simple as it just involves adding some beeswax to make it more solid. You can often find beeswax at the local health food store, but if you have no luck there, there are plenty of places online that sell it. Start by heating the oil and beeswax over low heat until the beeswax is melted. I have heard it recommeded to do 1 Tbs of beeswax per ounce of oil, but I found that to be way too much. I do 1 Tbs of beeswax per 3oz of oil. You can experiment with it to see what works for you. If it cools and is too hard then remelt and add more oil, if it is too soft then remelt and add more beeswax. When it is finished pour into jars. 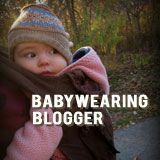 You can use babyfood jars, old cosmetic jars, pimento jars etc. To use, simply apply liberally to any skin ailment imaginable. ***If you want to give your oil extra healing properties you can do what I always do and add some Lavender Essential oil and Vitamin E (which also works as a preservative). I'll typically do around 5 drops of Lavender EO and a few drops of Vit E per ounce of oil. Add them in after the beeswax has melted and you have taken it off the heat. If you are giving as gifts don't forget to make labels. And if the kids helped then letting them name the ointment after themselves adds a personal touch! Healing herbs right outside my front door. 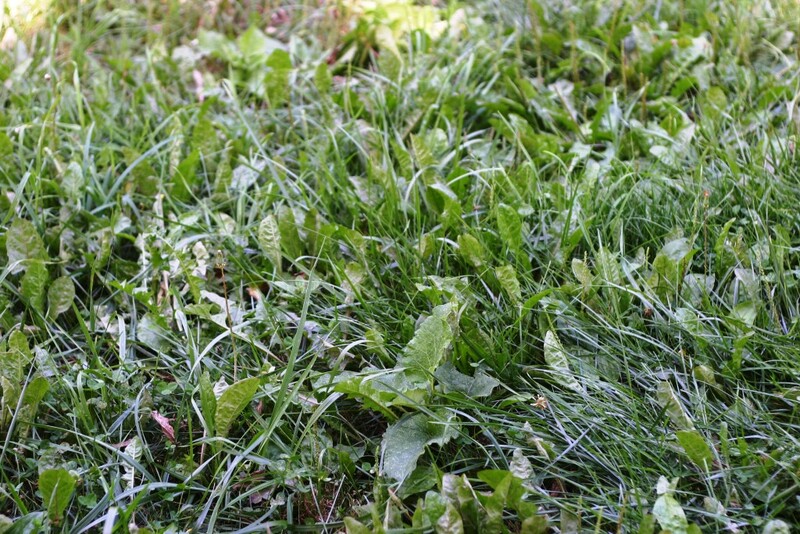 In this picture I spy plantain, burdock and dandelion! 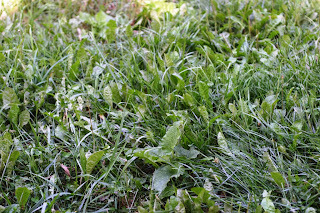 To think that this plant is really good for diaper rash and just lying around over the backyard. I think I might give it a try too. Also this great home remedies for diaper rash I find while searching. Thanks!